Are you monitoring your mainframe (z/OS) platform 24x7? Does your Security Information and Event Management (SIEM) strategy encompass your company’s mainframe? No existing SIEM platform on the market today was designed specifically for the z/OS operating system – this is a gap in your compliance strategy. And this gap, if not quickly remedied, can put your company at risk. 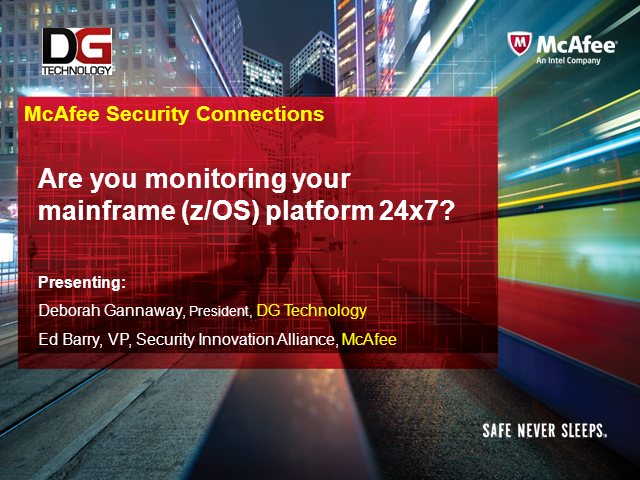 Join DG Technology for a discussion on MEAS™, the Mainframe Event Acquisition System™, which enables companies to collect, store, report and analyze data in real time, through seamless integration with McAfee’s Security Management and SIEM technologies. Title: Are you monitoring your mainframe (z/OS) platform 24x7?